Tucson Wrong Diagnosis Attorneys, Medical Malpractice Lawyer | Russo, Russo & Slania, P.C. Patients deserve competent, skilled medical care, because when a health care professional makes the wrong diagnosis, the results can be devastating. Not only can a patient fail to recover, but they may suffer additional medical problems that cause pain and suffering. Wrong diagnosis can often be attributed to medical malpractice. If you have become the victim of medical malpratice in Tucson, you deserve financial compensation for your suffering. The Tucson wrong diagnosis attorneys at Russo, Russo & Slania, P.C. can help you bring a claim for medical malpractice when you are the victim of an incorrect medical diagnosis. Health care professionals have a serious and important job to do when they are entrusted with the safety and medical care of their patients, so when they are careless and make a mistake, they should be held to justice. Contact Russo, Russo & Slania, P.C. at (520) 529-1515 to learn how you can recover financial compensation to make up for your injuries and expenses resulting from a wrong diagnosis. There are numerous ways that becoming the victim of a wrong diagnosis can impact you. First, you may have undergone testing or procedures that you didn’t need, and you’re facing a mountain of medical bills as a result. Additional medical testing was likely required to eventually arrive at the correct diagnosis. Your medical condition may have gotten worse because you didn’t get the care that you needed in time, and now it may be more difficult to treat you because of the time that was wasted. Any additional medical expenses that you incurred because of the wrong diagnosis can be part of your medical malpractice claim. If you had to go through testing or treatment that you didn’t need, you can include these costs in your claim. Also, you may claim any medical expenses for additional care because you originally went untreated for your actual condition. A lawyer can help you gather the evidence necessary to prove these losses. They have access to experts who can interpret your medical records, an essential part of a medical malpractice claim. Without a lawyer, you are unlikely to be able to successfully bring a claim for compensation, particularly if you are still recovering from your injury or illness. With a lawyer’s help, you are likely to receive far more money than you would on your own. Why Choose Russo, Russo & Slania, P.C. to Handle My Case? The medical malpractice attorneys at Russo, Russo & Slania, P.C. have experience conducting investigations to determine whether and how a wrong diagnosis occurred. 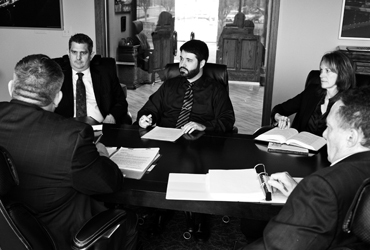 Our team works to investigate your case to determine what happened and what the medical professional should have done. Our team works diligently to identify the overall impact that the wrong diagnosis had on you, your medical care, your finances, and your family. The goal is to help you receive compensation that fully and fairly represents the financial losses, physical pain, and emotional suffering that you endured because of the wrong diagnosis. We have been helping victims of medical malpractice in Tucson for over 60 years, and we are ready to help you as well. All medical malpractice claims in Tucson are based on standards of reasonable, professional care. Wrong diagnosis claims fall under the same legal standards that apply to all other medical claims. Health care professionals always have a duty to exercise reasonable care based on professional standards. When a health care professional evaluates a patient, they must have the necessary skill to make the correct diagnosis, exercising the appropriate care and thoroughness. If they miss a diagnosis because of carelessness or incompetence, it will likely amount to medical malpractice. The standard for medical malpractice is based on what an ordinary, reasonable, and competent medical professional should have done in the same circumstance. If a reasonable doctor with ordinary training and diligence would have made the correct diagnosis, the doctor that made the incorrect diagnosis is liable for medical malpractice. A doctor cannot avoid medical malpractice liability for the wrong diagnosis by claiming that an ordinary, untrained person could not have made the correct diagnosis. Instead, all medical professionals must perform to professional standards that take their advanced training into account. A wrong diagnosis medical malpractice case can be based on incompetence, error, carelessness, recklessness, or intentional misconduct. What Can I Recover for a Wrong Diagnosis Medical Malpractice Claim? Your unnecessary medical bills are an essential part of your wrong diagnosis claim. However, they are only one part. A victim of medical malpractice has many kinds of losses — financial, mental, emotional— and they may be valued and included in your wrong diagnosis claim. If you have prolonged physical suffering because the wrong diagnosis left you without appropriate care, you can place a value on your pain and suffering. You may be experiencing depression and feelings of hopelessness because of what occurred. Other types of financial harm may be a part of your claim, including lost wages if you were unable to work because you didn’t receive appropriate medical care. If you require additional help as a result of your misdiagnosis and lack of proper treatment, that can also be part of your claim. If your loved one tragically died as a result of a wrong diagnosis, you can also be compensated for their loss through a wrongful death claim. This claim may include compensation for your loved one’s medical expenses that they incurred up until their death because of the wrong diagnosis. It may include compensation for their funeral and burial costs. It may also include compensation for loss of support, both financial – such as money they would have earned in their lifetime – and emotional. Being the victim of a wrong diagnosis can be a financially, physically, and emotionally daunting experience. If you or a loved one was hurt because of a wrong medical diagnosis, you have legal rights. At Russo, Russo & Slania, P.C., our team fights for justice for wrong diagnosis victims in Tucson and throughout Arizona. Call us at (520) 529-1515 or contact us online to discuss your case with one of our experienced incorrect diagnosis lawyers. Let us fight for you and get you the compensation you deserve. Russo, Russo & Slania, P.C. © 2017 by Russo, Russo & Slania, P.C.. All rights reserved.